The Best Destination Wedding blogs from thousands of top Destination Wedding blogs in our index using search and social metrics. Data will be refreshed once a week.Also check out Top Destination Wedding Youtube Channels list for Top videos on Destination Wedding. 2.8 Great Destination Weddings | Destination Wedding Packages, Beach Weddings. 2.17 La Concha Weddings - A Destination for Every Love Story! 2.25 Beth's Beautiful Getaways - Dream Destination Weddings and Honeymoons. 2.34 Jet Fete - The Destination Wedding Blog. Destination Wedding newsletter is a comprehensive summary of the day's most important blog posts and news articles from the best Destination Wedding websites on the web, and delivered to your email inbox each morning. To subscribe, simply provide us with your email address. NYC About Blog The ultimate Destination wedding planning guide. Get unique ideas, see real destination weddings, vendor directory, etiquette Q&A, checklists, tips & more! Facebook fans 965. Twitter followers 1,653. UK and France About Blog French Wedding Style is dedicated to providing a premium resource to help brides plan their weddings in France and provide inspiration for French Weddings. Facebook fans 12,601. Twitter followers 5,192. Everywhere! About Blog To give couples worldwide, the inspiration and information they need to plan the destination wedding, honeymoon or romantic getaway of their dreams. Facebook fans 6,012. Twitter followers 61,249. Mexico, Caribbean, and USA About Blog Weddings by Funjet believe every love story deserves an epic setting. Experts explain what they do to make your dream destination wedding a reality. Facebook fans 55,911. Twitter followers 1,409. Toronto, Worldwide About Blog LUXE Destination Weddings is a group of destination wedding experts that specialize in stress- free destination weddings at the world's most exclusive hotels and resorts. Facebook fans 24,686. Twitter followers 23,693. About Blog Destination Weddings to exotic beaches in tropical destinations. Professional service at the lowest rates so you can have the wedding of your dreams! Facebook fans 4,522. Twitter followers n/a. About Blog Romance Travel Group is your key to a successful destination wedding, honeymoon or vacation getaway! As industry recognized leaders in the art of destination wedding and travel planning, our team of agents has dozens of awards and accolades, and thousands of very happy brides, grooms, couples and guests. Facebook fans 4,161. Twitter followers n/a. 8. Great Destination Weddings | Destination Wedding Packages, Beach Weddings. About Blog At Great Destination Weddings, we love connecting couples with stunning locations in the world to get married. Great Destination Weddings online directory makes planning your dream destination wedding easy. Facebook fans 5,391. Twitter followers n/a. About Blog Bula Bride is a blog designed to inform and inspire Fiji destination brides in their planning - beyond the package. Facebook fans 7,589. Twitter followers 483. Kelowna, BC, CA, V1Y 9V9 About Blog Liz Moore Destination Weddings brings your wedding vision to life. They specialize in affordable Caribbean, Mexico, Hawaii, Costa Rica wedding destinations. Facebook fans 2,814. Twitter followers 448. Mexico About Blog Creative Destination Events is a premiere wedding and event planning and design company in Los Cabos, Mexico. The renowned team specializes in working with destination brides from around the world, who are looking for trusted professionals to bring their wedding dreams to life. Facebook fans 8,087. Twitter followers 346. Puerto Rico, USA About Blog Puerto Rico's leader in legal, beautiful and effortless Puerto Rico destination wedding and elopement packages to make your wedding day magical. Facebook fans 2,321. Twitter followers 206. Mexico About Blog In this blog you will find helpful articles about destination weddings and all the details that go along having a successful beach wedding. Facebook fans 1,849. Twitter followers 560. 6655 Gulf Blvd, St Pete Beach About Blog Florida Beach weddings, vow renewals, intimate beach elopements, commitment ceremonies and more at our wonderful beach locations. Facebook fans 5,140. Twitter followers 113. India About Blog Also know as "Regal Wedding", this site guides you, consults you and help you making right decisions pertaining to your wedding plan. Specialised in Goa, Rajasthan and Kerala. Facebook fans 2,813. Twitter followers n/a. Ireland About Blog Fly Away Bride is an online space dedicated to couples planning their dream destination wedding in Europe. Aim is to provide information and inspiration that will help you plan your perfect wedding abroad. Facebook fans 6,889. Twitter followers 2,000. 17. La Concha Weddings - A Destination for Every Love Story! San Juan, Puerto Rico About Blog Your Dream Wedding... starts here. Warm tropical sunsets, shimmering Caribbean beaches and sultry, hot tropical weather. Puerto Rico is the location to host your fabulous wedding. Facebook fans 4,989. Twitter followers 379. New Delhi, India About Blog Planning for Destination Wedding in India and South East Asia can be a task specially when you are at a different place, different timezone at various locales viz. Royal Palaces, Beach Hotels, Serene Backwaters, Majestic Hills, Honeymoon Options, Spa Destinations. Facebook fans 3,078. Twitter followers 1,486. UK About Blog WOW Our Wedding, a UK wedding blog and directory full of real weddings, wedding ideas, wedding venues and wedding suppliers to WOW your wedding! Facebook fans 727. Twitter followers 92. About Blog Destination Weddings, Beach Weddings, Find the perfect location for your Wedding Day, Over 30 years of Experience in Destination Wedding Planning. Facebook fans 1,927. Twitter followers 30. Milwaukee, WI About Blog Larimar Travels exists to make sure that your honeymoon or destination wedding is one of the most spectacular moments of your life. Will Medina’s expertise with romance travel planning guarantees that you can relax as every detail of your day is taken care of. Facebook fans 628. Twitter followers 35. About Blog Destination wedding travel agents and planners specialising in group wedding travel, all-inclusive destination weddings and unique tropical escapes. Facebook fans 440. Twitter followers 697. About Blog We serve brides and grooms all over the country. Cabo San Lucas, Mexico About Blog Cabo San Lucas Weddings is ready to help you plan your special celebration in Los Cabos, Mexico. If you’ve been wondering whether planning a destination wedding can be an enjoyable experience. Facebook fans 1,012. Twitter followers 2,400. 25. Beth's Beautiful Getaways - Dream Destination Weddings and Honeymoons. Pinckney, MI About Blog Beth's Beautiful Getaways Wedding planning can be a stressful and overwhelming time, and it’s desire is to relieve that by helping you create your perfect destination wedding and honeymoon. Tobago, Trinidad & Tobago About Blog Tobago Weddings helps intimate stress free destination weddings in the Caribbean Island of Tobago for couples and small groups. Facebook fans 6,108. Twitter followers 371. Mississauga, Ontario About Blog Ultimate Destinations Weddings are a boutique destination wedding company offering Ultimate Experiences! Facebook fans 1,274. Twitter followers 55. North America About Blog DestinationVows is a Canadian Destination Weddings & Honeymoons Planners Specialists working with some oft the best planners across Canada. Facebook fans 1,312. Twitter followers 1,450. About Blog ikebana Maldives - Maldives Leading wedding, Event Florist and Flower Shop. Facebook fans 26,377. Twitter followers n/a. About Blog Unique and stylish destination weddings in Europe : your wedding agency specialized in wedding planning in Portugal, France, Italy, Greece & Spain. Facebook fans 3,236. Twitter followers n/a. ST LUCIA About Blog Awesome Caribbean Weddings, based in St Lucia, has twenty years experience planning perfect Caribbean Weddings for couples from all over the world. Facebook fans 4,034. Twitter followers 2,342. Canada About Blog Romantic Planet Vacations has been specializing in honeymoons and destination weddings since 2004. Facebook fans 3,673. Twitter followers 988. About Blog Everything you need to plan your dream wedding overseas, including great tips, invaluable advice and a comprehensive wedding supplier directory. Facebook fans 2,016. Twitter followers 1,236. 34. Jet Fete - The Destination Wedding Blog. About Blog JetFete plans a luxurious getaways, inspired events, and expert advice for globetrotting brides and grooms. Facebook fans n/a. Twitter followers 1,646. 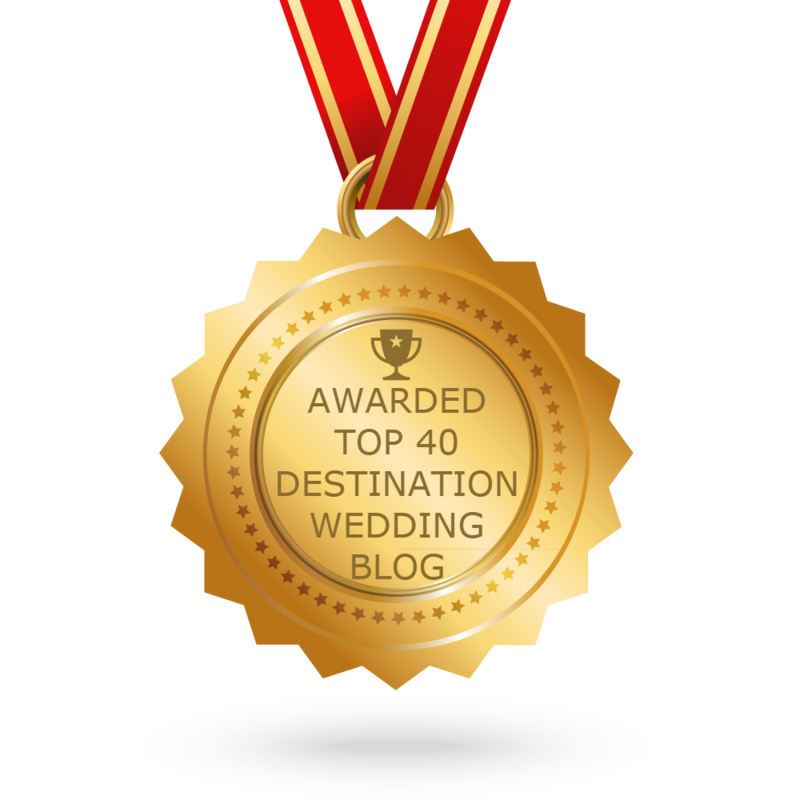 CONGRATULATIONS to every blogger that has made this Top Destination Wedding Blogs list! This is the most comprehensive list of best Destination Wedding blogs on the internet and I’m honoured to have you as part of this! I personally give you a high-five and want to thank you for your contribution to this world.